Johnson beat Jordan Spieth by a shot at the Tournament of Champions at Kapalua Resort. Johnson (the big lad on the right) celebrates with his three-year-old son Wyatt. ZACH JOHNSON WON the Tournament of Champions after rolling in seven birdies en route to a bogey-free 66 in the final round at Kapalua Resort. The 37-year-old American tied Billy Horschel for the low round of the day to win the USPGA Tour tournament by one shot. “Today was a grind but I felt at ease,” Johnson said. “I was comfortable. Yesterday, I didn’t score that well. Jordan Spieth, who is the reigning Tour rookie of the year, shot 69 and took second place at 18-under. Johnson finished the event at 19-under to earn his 11th USPGA Tour title and said his putting was the key. “I hit some quality shots that helped and some quality putts that helped even more,” he said. Former US Open winner Webb Simpsontied for third at 17-under. He finished alongside Kevin Streelman, who birdied four of his last five holes for a final-round 67. Jason Dufner (15-under) grabbed fifth while Dustin Johnson, Adam Scott, Matt Kuchar and Horschel shared sixth a further shot back. 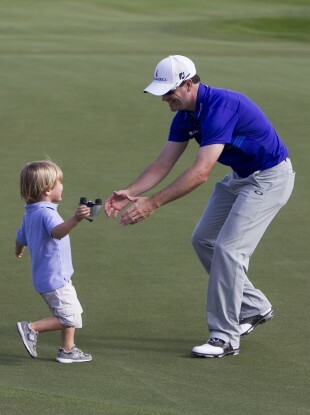 Email “Zach Johnson holes clutch chip on his way to Hawaii win”. Feedback on “Zach Johnson holes clutch chip on his way to Hawaii win”.